Six homemade petrol bombs have been found in a bag belonging to the man who attacked security personnel with machete and wasp repellent at New Orleans International Airport. The 63-year-old attacker was shot three times and later died in hospital. The attacker was identified by the authorities as a 63-year-old Richard White. The man was proclaimed dead in the hospital where he was being treated for three gunshot wounds, police said on Saturday. “He was pronounced dead at 4:02 pm,” said a spokesman for the Jefferson Parish Sheriff's Office. 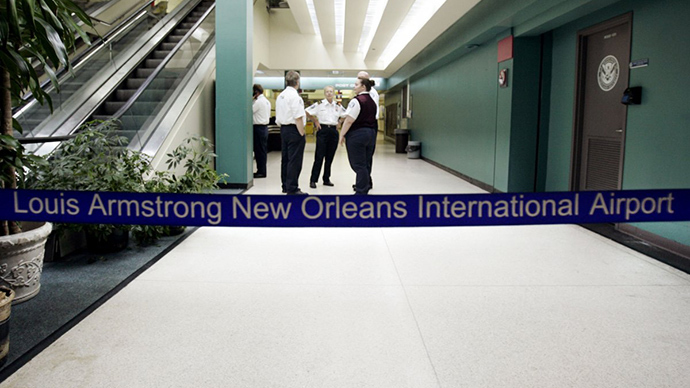 Inside the bag belonging to the man, police discovered six Molotov cocktails with cloth wicks soaked in gasoline, Sheriff Newell Normand said earlier at a press conference at the Louis Armstrong New Orleans International Airport. A barbecue lighter and a letter opener were also found in the bag. When authorities searched White's car they discovered smoke bombs and tanks of acetylene, freon and oxygen. Residue from smoke bombs was discovered near White's body. Normand said the suspect had “mental health” issues and according to family accounts has refused “certain types” of medical care. He had worked as a taxi driver and had recently received his chauffeur's license. Normand said the motive for the attack is a mystery. On Friday, after approaching a security checkpoint White sprayed wasp killer on TSA agents. Then he drew a large machete and tried to attack security personnel. A TSA agent blocked the machete with luggage as White ran through a metal detector, chasing another agent. “She was being chased by the perpetrator with the machete. The officer began to fire because he was gaining on her very quickly,” Normand said. “Lt. Heather Slyve of the Jefferson Parish Sheriff's Office drew her weapon. White continued to swing the machete as she approached, and she fired three rounds, striking him in the face, chest and leg,” according to Normand. TSA Administrator Mel Carraway praised the actions, saying “a lot of lives were saved” by TSA agents.